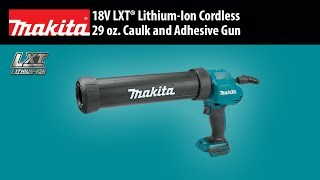 The 18V LXT® Lithium-Ion Cordless 29 oz. Caulk and Adhesive Gun (XGC01ZC, tool only) is a versatile, powerful, and lightweight solution for any contractor dispensing large amounts of caulk and adhesives, including window installers, drywall contractors, fire stop installers, commercial glazers, boat builders, and more. The XGC01ZC delivers 1,100 lbs. of dispensing force for even the highest viscosity adhesives and sealants. It features a 5-speed dial with 0-66 Inches Per Minute (IPM), and a variable speed trigger that allows the user to optimize the flow rate according to the application. It has a compact design at 18-7/8” with less weight (only 5.9 lbs. 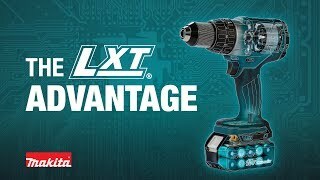 with 18V LXT® battery, sold separately). Convenience features include a 360° rotatable cartridge holder that fits 28-29 oz. cartridges, as well as a built-in L.E.D. light that illuminates the work area for improved visibility. The XGC01ZC also features an overload indicator light that notifies the operator when the tool is nearly overloaded to minimize breakage of the sealant cartridge. Capacity (caulk or sealants) : 29 oz. Dispense Force : 1,100 lbs. Net Weight (with battery) : 5.9 lbs. Shipping Weight : 7.7 lbs.